Sea kayaking in Maine through the numerous secluded coves, inlets and bays that line the southern coast is without a doubt one of the most spectacular ways for families with children or couples to discover the true beauty of this scenic area. There won't be any engine sounds to disturb either you or the wildlife you'll encounter while you're making your way along the region's rugged shore. Sea kayaking in Maine is a serene experience that is just between you, the sea, the fish, the harbor seals, the whales and the birds. Whether you're in the Kittery Point area in southernmost Maine, up by Kennebunkport or as far north as Old Orchard Beach, when you're sea kayaking in Maine you'll be quietly gliding your way through the water in much the same way the early Maine settlers did hundreds of years ago when they were traveling from one isolated coastal community to the next. Like them, you'll discover hidden beaches and uninhabited islands just waiting to be explored. If you'd love to get away from the stresses of everyday modern life, there is nothing more mentally relaxing than reconnecting with nature while you're sea kayaking in Maine. You can restore and recharge both your body and your soul by watching the scenic southern Maine coastline quietly pass by as you're paddling. Professionally guided sea kayaking trips are available through a number of outfitters in southern Maine and range from as short as a few hours to extended, multi-day overnight sea kayaking adventure experiences. Maine kayaking outfitters provide personalized attention, and their competent, certified instructors will assure your safety and comfort no matter how long your kayaking expedition lasts. Some companies offer themed kayak adventures, including eco-tourism trips and romantic sunset or moonlight paddles. Can you picture anything more beautiful than spending an evening gliding through calm waters while the colors of a spectacular sunset reflect off the never-ending gentle swells? Or being right in the middle of rays of moonlight dancing on the ocean instead of watching from shore? If you want a relaxing paddle that provides the opportunity to see and learn about some of Maine's abundant wildlife, you could try one of the eco-tourism kayaking trips that embark on journeys to find eagles and ospreys on the hunt for fish, terns and gulls swooping through the clean, clear air, and seals playing in the shoals. Professionally guided sea kayaking in Maine doesn't even require any special skills, because your guide will teach you everything you need to know before you begin your adventure. If you prefer self-guided sea kayaking, a large number of outfitters also offer kayak rentals, along with the equipment you'll need to have a safe but highly enjoyable time while you're sea kayaking in Maine. You'll be in charge of your own itinerary and can spend as much or as little time kayaking as you want. Southern Maine's rocky, scenic coast is rich with history and tradition, and you can get a strong taste of both by sea kayaking in Maine. For example, from your vantage point on the water you'll be able to watch Maine lobstermen plying their trade without disturbing them at their work. Our coastline is dotted with unspoiled, uninhabited coastal islands, which you can visit simply by paddling your way to a safe landing spot. While you're enjoying the sights and sounds of coastal Maine from your sea kayak, you'll be building memories of an extraordinary adventure that you'll savor for a lifetime. 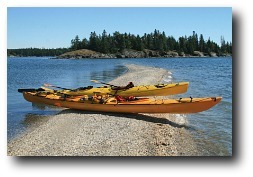 Think about sea kayaking Maine without a kayak! The lastest ocean sport around here combines both surfing and ocean kayaking -- riding on a stand up paddleboard. 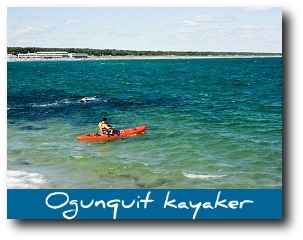 Ocean kayaking and stand up paddling available on Wells Beach or on the Ogunquit river. 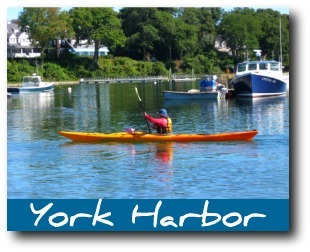 Kayak rentals, specialty and overnight tours. Kayak and stand up paddleboard rentals and guided tours. Departures from Portsmouth, New Hampshire. Guided kayak and stand up paddleboard tours and rentals. Specialty tours such as eco-tours.